Taking a break from promoting our new Jurassic Coast designs we headed off to Snowdonia for the Easter break. We therefore thought we were haunted by fossils and all things prehistoric when the youngest member of the Climb it Range party (aged 9) noticed a large sea shell fossil on the summit of Snowdon, over 1,000 metres above sea level. 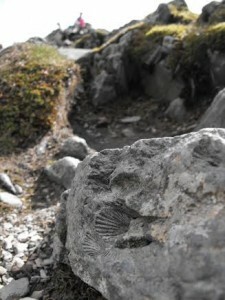 Fossils on Snowdon…How on earth did they get there? Apparently this fossil is over 400 million years old. It’s a former sea creature from the Ordovician era. It may seem hard to believe but it originally lived in the southern hemisphere, dying in shallow tropical seas. It was then uplifted when the Snowdonia mountains were formed all those years ago. Tagged on: fossils on snowdon where are the fossils on Snowdon?